In case you didn't believe me, this is my back yard. 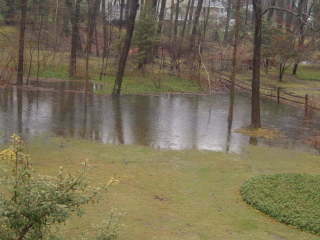 We do not, usually, have waterfront property. This is the reason that I was able to stay inside and watch a TiVo-terrible movie, one so dreadful that it won the first Cringeworthy Crown ever. Although it may be too soon, there's a chance that the new Fox show, Drive, could also merit a Crown of Cringeworthiness. I watched only because the captain of the Serenity, played by Nathan Fillion, is starring in this new show. Unfortunately, it stars way too many anorexic young blondes, makes no logical sense (why would anyone decide to pay $32 million to the nonprofessional driver who wins a secret cross-country race), and I really don't care who wins anyway. Fillion was so fabulous in the ill-fated Firefly (also on Fox), that I longed to see him on the small screen again. I should have kept my fond memories intact. Sadly, I'm not sure I'll be able to get through even the pilot episode, even rapid-TiVoing through the commercials. It's just that, well, I don't really care about cars. Or about driving them. Or about the people who drive them. See? Here's the Great Fillion. And here's the too-skinny, too-young blonde. Hey, Fox! Just put him back on Serenity already!! Johnny Depp is a Boomer! Here in the Northeast, we are having a Sunday monsoon. It has been raining for nearly 24 hours straight; the roads are impassable, the 50 mile per hour winds are impending, and imminent household flooding is possible. All of this is to excuse my day of TiVo Dreaming, in which I watched TiVoed movies chosen by Mr. TiVo. I saw an incredible movie, called The Ninth Gate. Incredible in that it was so unbelievably bad, although it starred one of the most amazing actors alive: the delovely Johnny Depp. The phrase that comes to mind while watching this horrific mess of a movie--something about a book written by Satan that will call him to life--is this. What the hell was Johnny thinking??? The only interesting thing to come of this TiVo travesty is that I learned that Johnny Depp is a Boomer! Born in 1963, he just squeaks into our cohort--go Johnny go!! Actually, this experience has inspired me to create an award. I will call it The Cringeworthy Crown, in which an ordinarily talented actor/musician/writer/dancer participates in a work of art so bad that it makes the view cringe with vicarious embarrassment. I hereby award the first two Cringeworthy Crowns to..... Perfect Stranger, in which the usually semi-astute Bruce Willis starred, to his everlasting shame. Add to this a seond crown to the Depp display, The Ninth Gate: may it disappear into TiVo Limbo and never be seen again on this earth. Congratulations winners!